Fort de Joux, Franche Comté. Bordered by the Jura Mountains and Switzerland to the east, and Saône River to the west, Franche-Comté is a laid back, forested region conjuring up images of hillside vineyards and red-and-white Montbéliarde cattle, the two local hallmark industries that bestowed Franche-Comté its famed yellow wine and Comté cheese. The name Franche-Comté originally referred to the Free County of Burgundy. The 'Franche' part was added in 1478 to distinguish it more easily from the neighbouring Duchy of Burgundy. Like Alsace and Lorraine, the County of Burgundy was part of the Holy Roman Empire ever since its foundation in the 10th century. In 1481, Franche-Comté passes under Habsburgian rule - first Austrian, then Spanish (from 1556), like the Southern Netherlands. It was not incorporated into France until the Treaty of Nijmegen (1678), although enclaves like Montbéliard remained outside French control until the French Revolution. Nowadays, Franche-Comté shares much of its architecture, cuisine, and culture with neighbouring Switzerland. 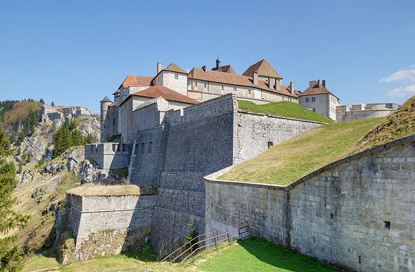 Vauban's citadel in Besançon and the Royal Saltworks of Arc-et-Senans are both listed as UNESCO World Heritage Sites. Famous people from Franche-Comté include (chronologically): the poet and novelist Victor Hugo, the painter Gustave Courbet, the leather goods designer Louis Vuitton, the chemist and microbiologist Louis Pasteur, the inventors of cinema Auguste and Louis Lumière, and celebrity chef Raymond Blanc. 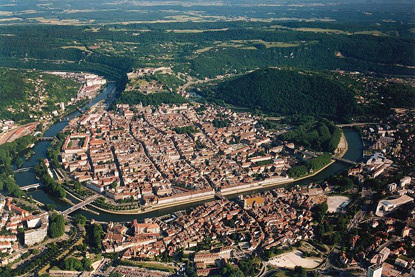 Besançon's strategic position in a meander of the Doubs River made it an important settlement since the Roman era. 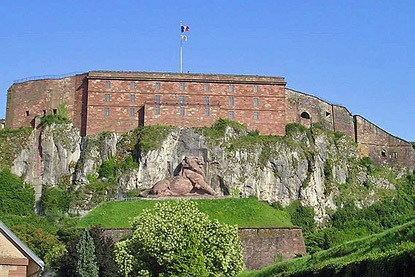 Its citadel, built by Vauban, is one of the largest in Europe. Besaçon was the first 'green city' of France and is listed as a UNESCO World Heritage site. 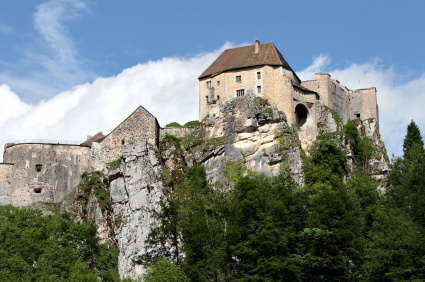 Known alternatively as the Fort de Joux or Château de Joux, this castle perched on the edge of a cliff in the Jura mountains commands the mountain pass "Cluse de Pontarlier" between France and Switzerland. The "Salines Royales" were important 18th-century saltworks. 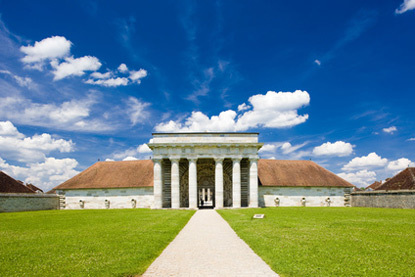 Its neo-classical buildings were designed by Claude-Nicolas Ledoux as an early Enlightenment project that strives to arrange buildings according to a rational geometry. A lovely village in the Loue valley. It is the birthplace of Realist painter Gustave Courbet. 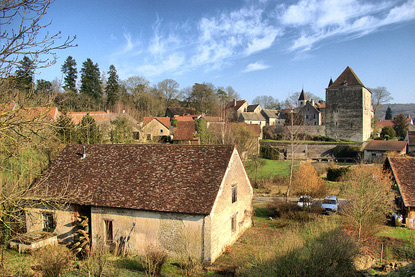 A quaint little village with a 13th century castle, a watermill and an oil mill. 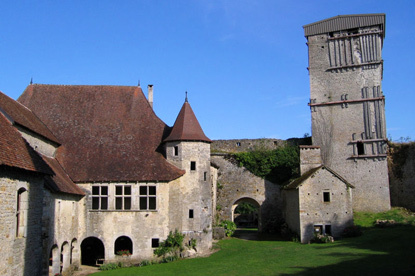 he Château d'Oricourt is a medieval castle erected in the middle of the 12th century. 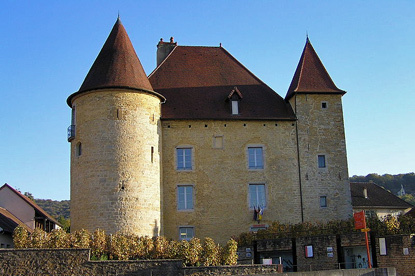 It is a concentric castle with a double enceinte, dominated by two 25-metre-tall square towers. 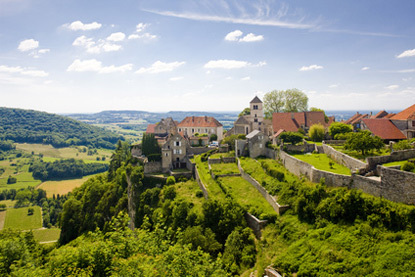 Picturesquely sited on the edge of a cliff overlooking the Jura Mountains, Château-Chalon is listed as one of the most beautiful villages of France. It produces the best yellow wines of Jura. Sitting amidst the rolling vineyards, the charming village of Arbois (pop. 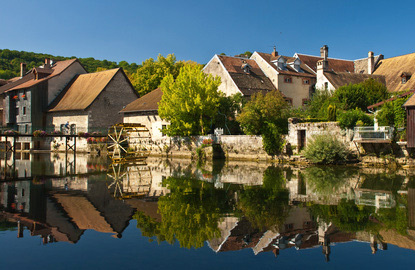 3,500) is considered the wine capital of the Jura. Its wines were already reknowned in Roman times. Cut off from Alsace in 1871, Belfort is the capital of the smallest French département. Its main attraction is its red citadel and castle.